Q. I am looking for a three-holders bin to hold bottles, cans and paper. What I have found is too small for a couple weeks collection. Any suggestions? 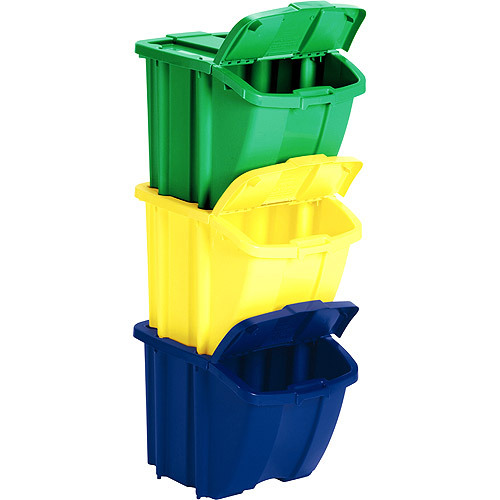 A. I’d recommend Stackable Recycle Bins –they are large capacity (18 gallons each) and come in a set of three, each a different color so you can easily color-code your recyclables. The bins are designed to stack with or without the lid to save space, and each has a carrying handle and a front flap that can stay open or be left closed. Q. I recently had a really awesome wooden shelf with hooks built in the hallway leading from my kitchen to the garage. The recycling container that holds the recyclables until they are wheeled to the street is in the garage. Rather than making a trip to the garage every time I am disposing of an item, I would like to find an attractive lined “laundry bag” of sorts to hang on my new shelf. It would be convenient and look nice, as we and guests pass by and through the hallway. Can you help me? A. I think a laundry bag could be awkward for holding recyclables since you’d need to use both hands to access the opening. A better alternative is the Canvas Door Knob Hamper, which has an open top for easy access, a slim profile, and a hook for hanging and carrying. If you’d still prefer to try using a laundry bag, two that might work are the Large Canvas Laundry Bag and the Laundry Bag With Strap.